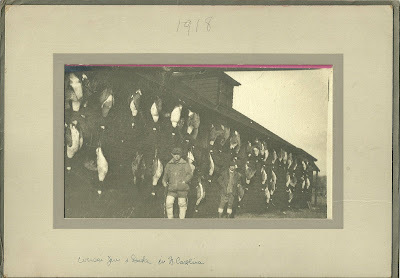 Photograph dated 1918 showing the outcome of a goose hunt in North Carolina. Unfortunately, the only identification on the photo is what you see on the front: 1918 Cousin Jim and Dada in N. Carolina. If you happen to recognize the building, please scroll to the bottom of the page to the comments box or contact me directly, so that I can update the location information. Thanks for stopping by!